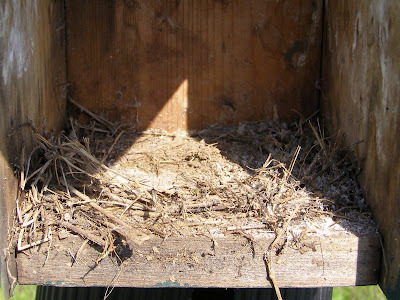 Memorial Day usually coincides with the end of the first nesting attempts in the bird boxes. That makes it an opportune time to make the rounds and see how things are going. 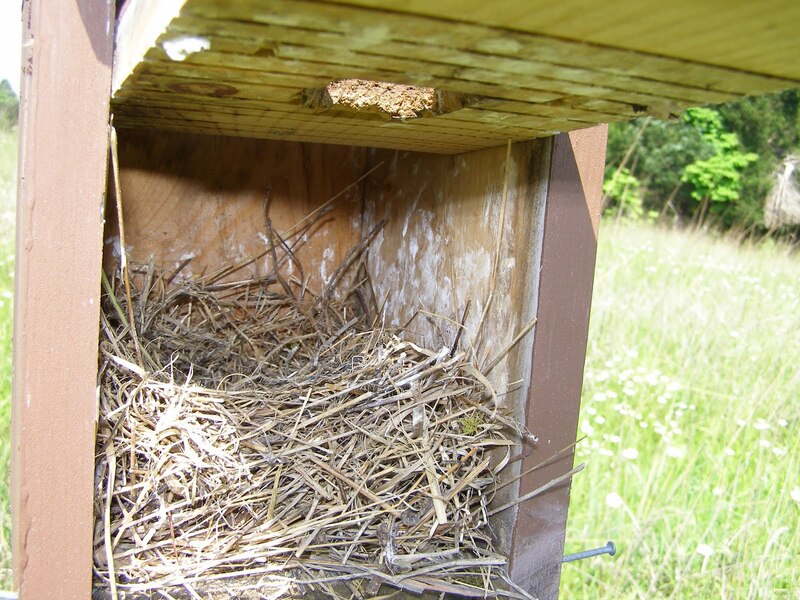 Bluebirds are the first to nest in the boxes each year and are usually finished with their first brood by now. 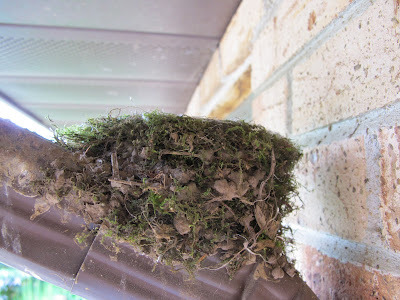 I try to clean the boxes before another pair of birds moves in and builds a new nest on top of the old. 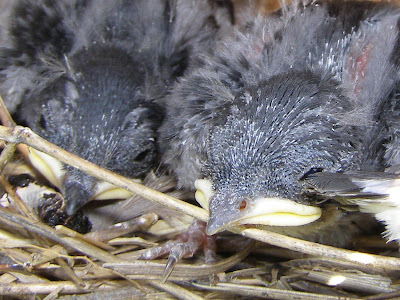 It’s always a dusty mess beneath the nest. There’s an art to avoiding the blowing dust created by sweeping out the box. 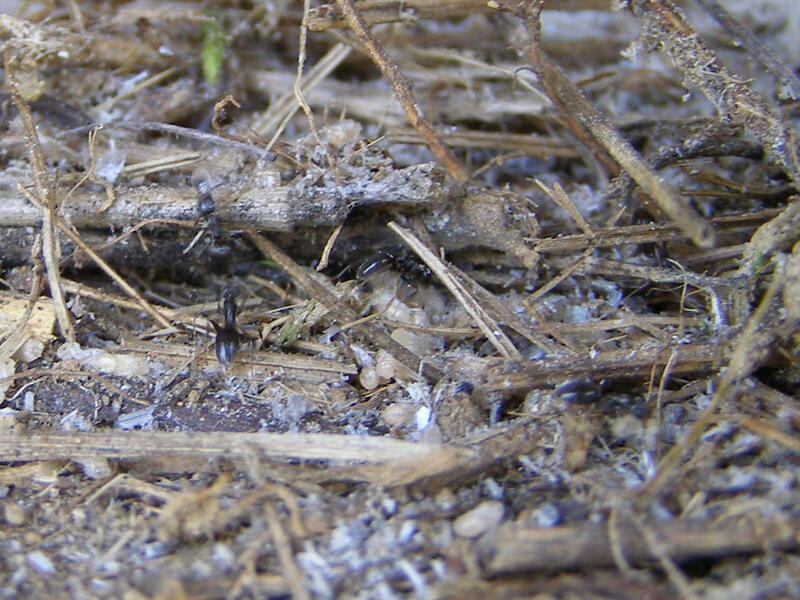 Ants have moved in and have quite a cache of larvae and pupae stored in the old nest material. The presence of ants could cause potential nesters to avoid this nest box. The ants could also be trouble for any developing nestlings. I leave the box clean and ready for the next occupants. 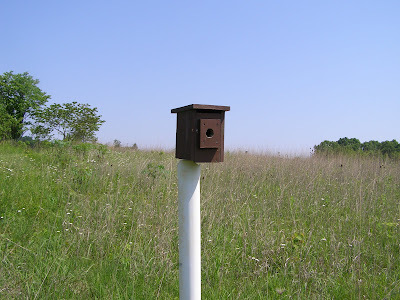 I didn’t find any active Bluebird nests. I see a lot of Bluebirds sitting on the utility wires or the fence, along with what appear to be their latest batch of young. 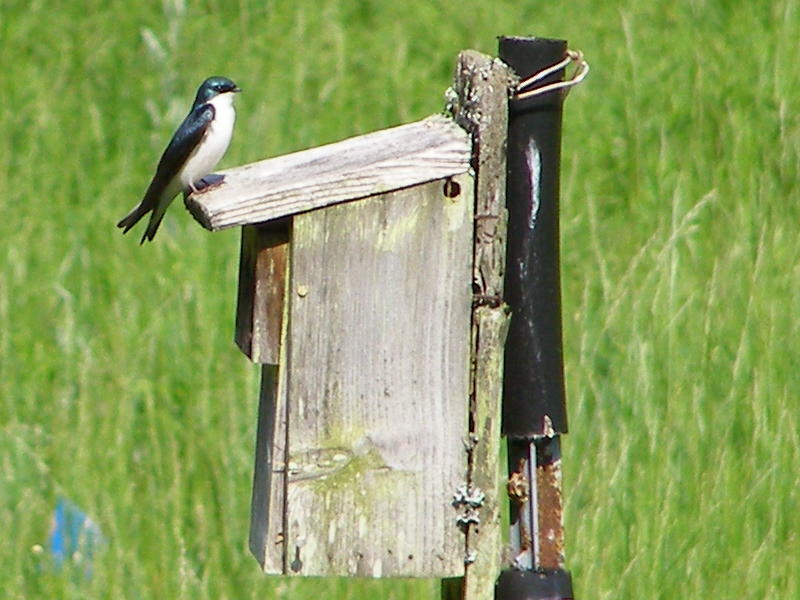 All of the active nests were those of Tree Swallows. The range of activity stretched from a newly constructed nest to a batch of older youngsters. There were two nests with four eggs in each. There were also two nests with older nestlings. 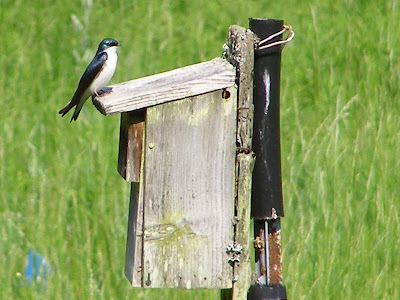 It looks like Blue Jay Barrens will once again make a significant contribution to the Tree Swallow population. Competition for nest space is already intense. Some of these birds are going to have to move off and find new territory. As is usual, I found myself between hungry birds and their parents. Insects are out in abundance, so I expect these little guys will be filled to capacity. My year is filled with annual events that mark each season and give a type of stability to the changing face of Blue Jay Barrens. Bird comings and goings, bloomings, hatchings, animal appearances, plant growth and decline; each event confirms my belief that the heart of Blue Jay Barrens is still strong and healthy. Box turtles will always be special to me and the spring season is full of their vigorous reclamation of life following the winter hibernation. I never tire of watching them. Turtles are a wonder. 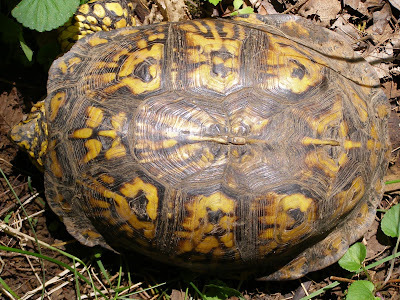 An Eastern Box Turtle has a life span that rivals that of humans and it may live that entire life within an area no bigger than a football field. This large male shows the signs of many years spent wandering this ground. It may have been here for the last 70 or 80 years and might have witnessed plowing of the hillsides and planting of agricultural crops, along with the massive erosion that followed. I can imagine this fellow stepping out of the way of a cow’s hoof, closing up as it’s nearly run over by a log truck, feeling the ground shake beneath its shell as the farm tractor rumbles by, and being picked up and examined by several generations of children. This turtle has probably witnessed much of the site history that I’m so curious about. 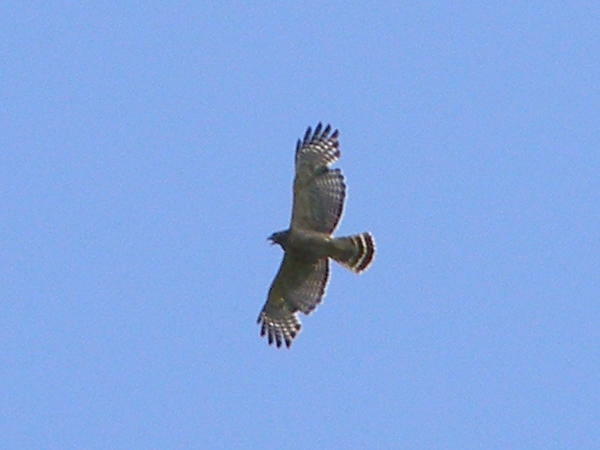 Cooper’s Hawks are regulars at Blue Jay Barrens. Although they are regularly seen hunting small birds near the feeders, it’s this time of year that they are most noticeable. They become quite vocal during the nesting and young rearing period. I find an active nest about every other year, but they probably nest here every year. Most nests are high up in the tallest cedar trees and are very hard to spot from the ground. Some years they appear to use an old squirrel nest as a base and this makes it even harder to recognize from below. Tree Swallows reenact the same performance each year. Even though they look and act the same, I’m sure they’re not the same pair. The only difference seems to be an increase in numbers. 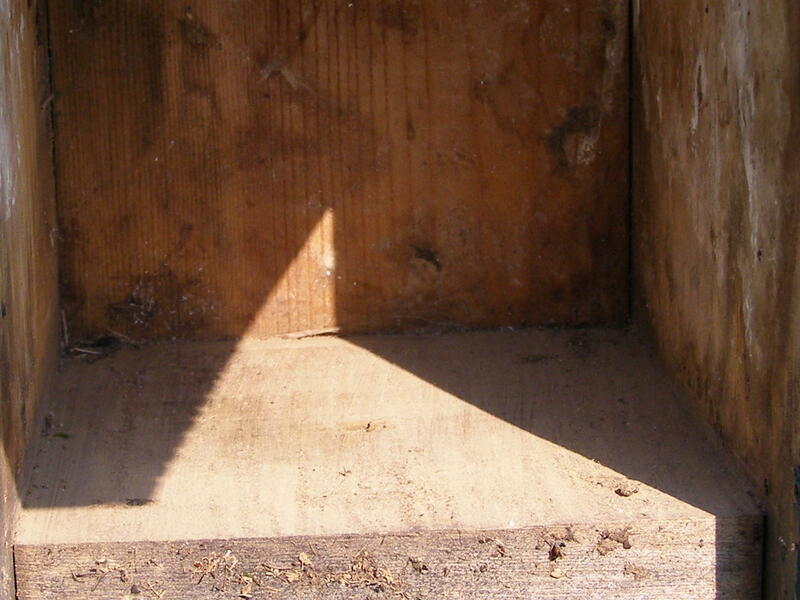 The number of returning swallows now greatly exceeds the number of available nest boxes. 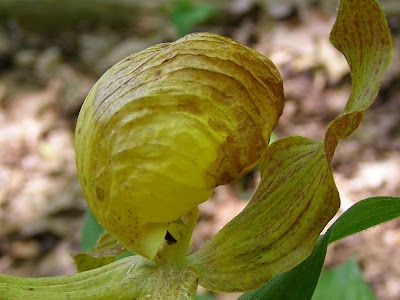 The failure of the Yellow Lady’s Slipper to produce seeds is one of those annual events that I would like to change. It’s now clear that the bend in the double bloomed stalk is going to result in the withering of the flowers. I don’t know what caused the stalk to bend and then dry as this one has. I’ve seen a lot of strange things happen to this plant and this year has added a couple of new ones. The single flower that flipped upside down is shriveling quickly. There’s probably no chance of this one producing any seed. I suppose it’s alright to put in a few disappointments as long as there are enough joys to cancel them out. 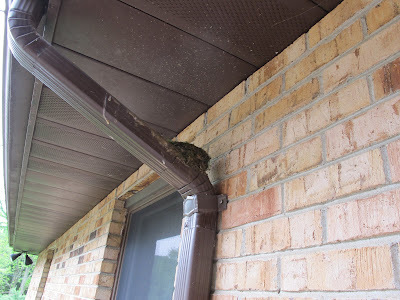 Each year, we seem to end up with a Phoebe nest just outside our front door. I enjoy having Phoebes around, but they never seem to fare well this close to the door. 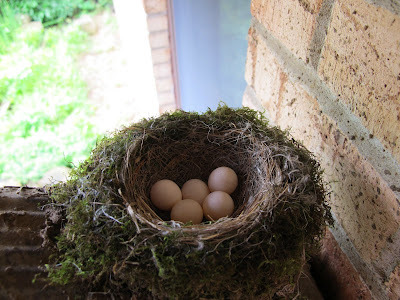 I try to discourage the nest building, but there always comes a period of a few days when I leave early every morning and get back after dark every night and when I next see things in the daylight, the birds have thrown together a nest and popped in a couple of eggs. Everything goes well for a while until an abnormally cool night coincides with some type of disturbance on our front porch. The bird flies into the night and the eggs or young succumb to the chill. Five eggs is about normal. 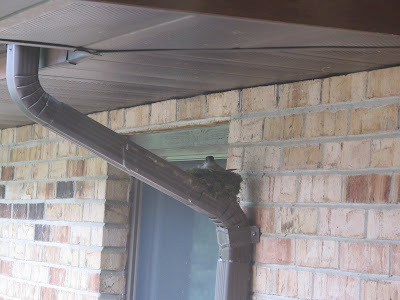 I’ve put nesting platforms at different places around the house and the Phoebes have successfully nested on them. The pair that built this nest had already begun the put eggs in a nest around the corner from the door, so I wasn’t expecting them to start a new nest. 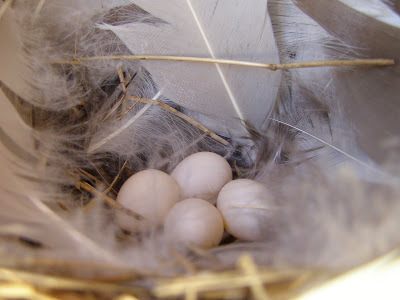 When I found this nest, I checked and found that the first clutch had disappeared. I question the suitability of an aluminum downspout as a nest platform. A chilly rain can cool that aluminum in a hurry and I can’t imagine that being very good on the eggs. 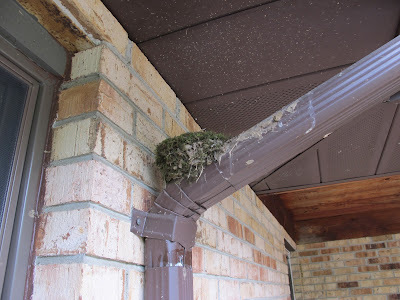 The Phoebe that built this nest was messier than most. There’s mud smeared along the downspout, mud on the wall and look at all the splatters on the soffit above the nest. Normally it’s the female that builds the nest. Maybe the mess is where the male jumped in and tried to help. We do get a good view from the window. 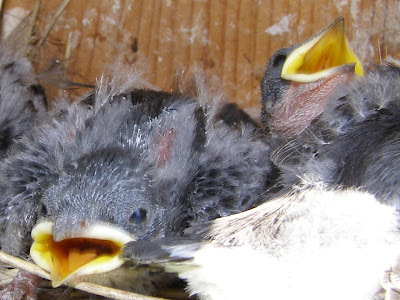 Maybe we can ward off disaster this year and enjoy watching the care of a Phoebe family. Many animals have an instinctive need to disperse. Under favorable conditions they will just take off and travel. The result is a sharing of genetic material among different populations and the colonization of new territories. Dispersal instincts have allowed this Green Frog to claim a new territory in my water garden. The clunks and croaks he makes advertise his desire to share genetic material. It’s all for the good of the species. 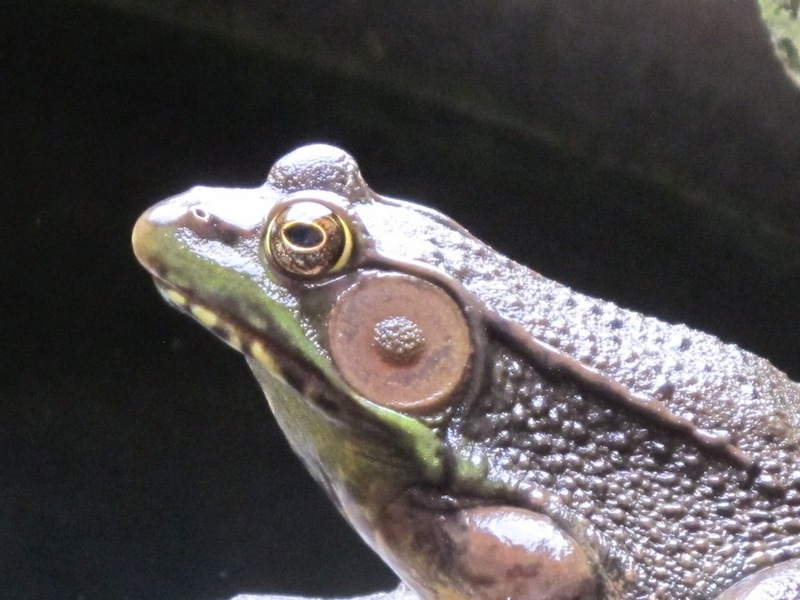 The disc on the side of the frog’s head is the tympanic membrane, also referred to as the ear drum. 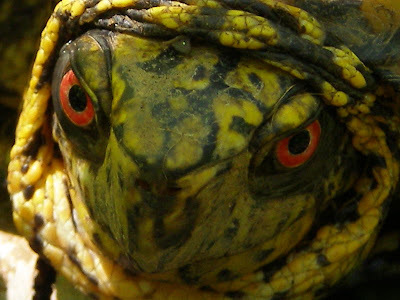 A tympanic membrane with a diameter much larger than the eye indicates a male frog. 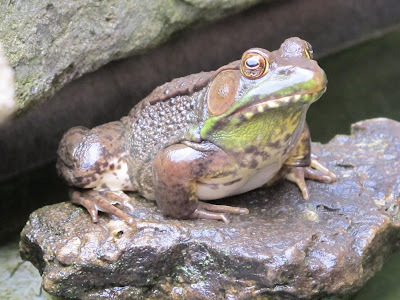 Green Frogs closely resemble the Bullfrog, but can be distinguished by the ridge of skin beginning behind the eye and running down the back. 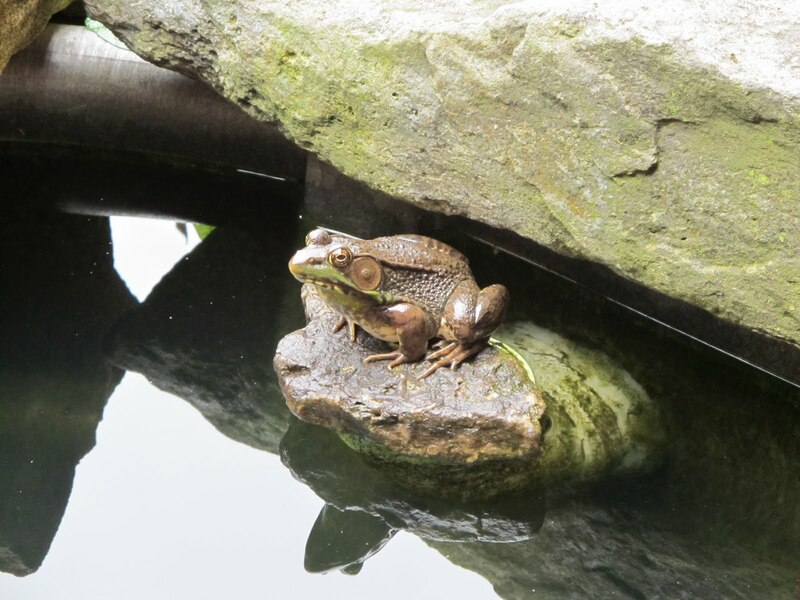 Although the name says green, the dominant color of these frogs seems to be brown. Most of the green is around the mouth and throat. This small pool has about six square feet of surface area and is separate from the larger water garden. 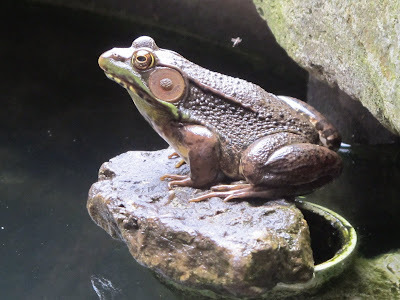 The male frog easily dominates his pool. Any insect coming to the water is well within the frog’s striking range, so he remains quite well fed. 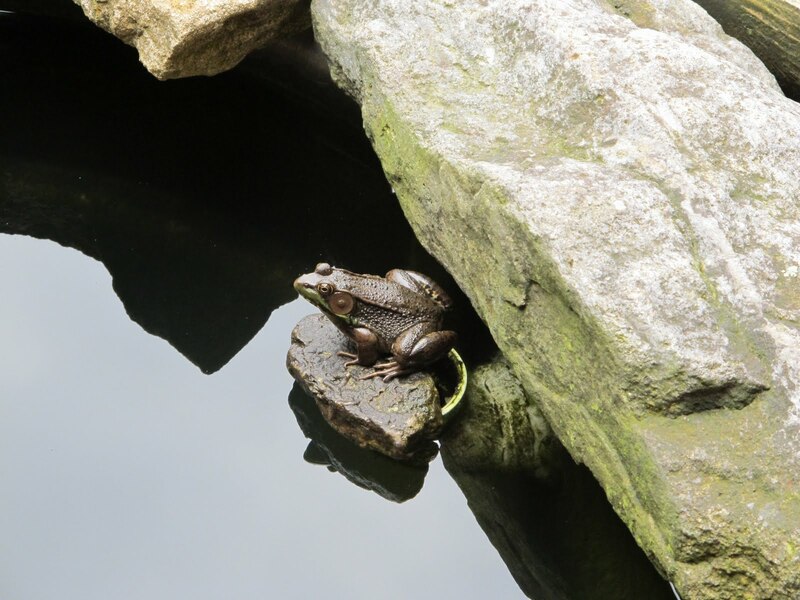 Of course, the smarter insects stay behind the frog’s head. It’s nice when a plant responds to your management efforts in such a way that gives confirmation that you are moving in the right direction towards your goal. In the distance is a prairie opening that used to be separated from this wooded area by a thick screen of Eastern Red Cedar. Very little light could penetrate the woods and the area remained relatively bare of plants. My goal here was to create a more gradual transition from full sunlight to heavy shade and provide a broader range of conditions in which different plants could thrive. 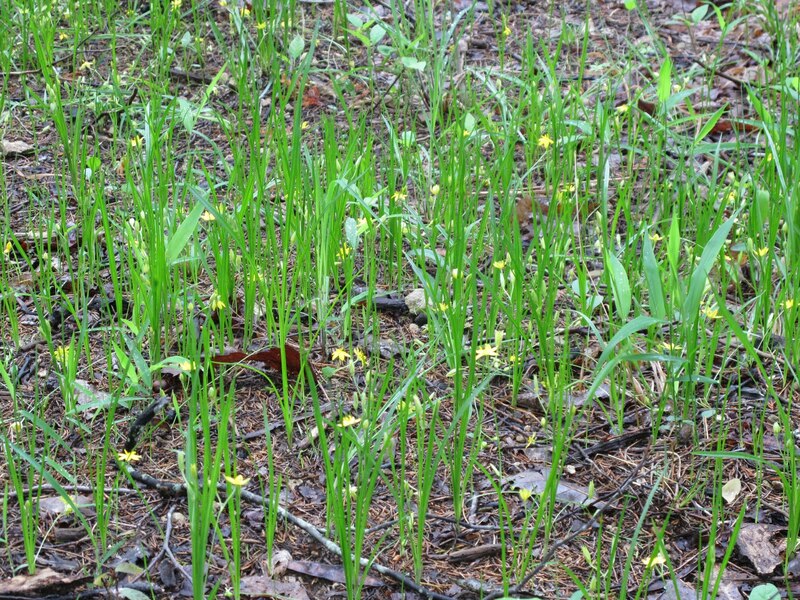 This is Yellow Stargrass, Hypoxis hirsuta, and the plant that makes me believe I am getting positive management results. 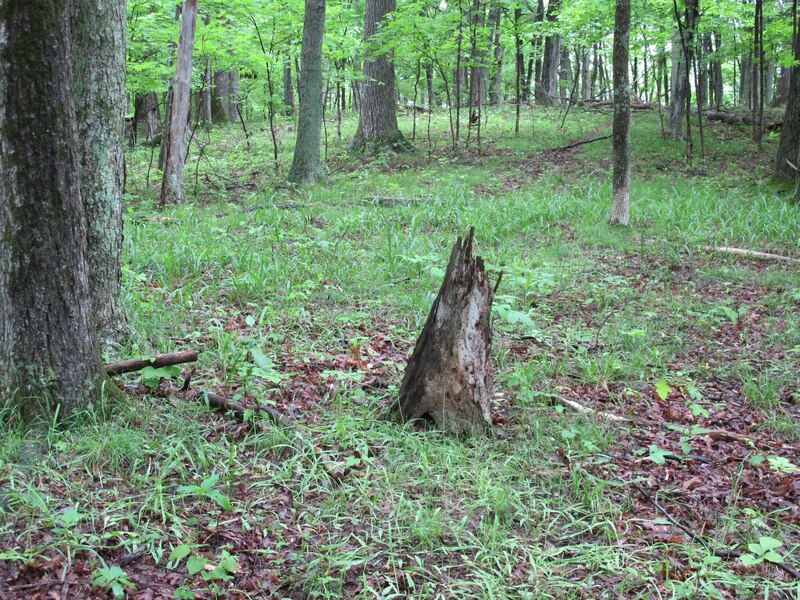 When I began clearing, the Stargrass existed solely as a narrow band along the open side of the cedars. The dry, open slope downhill of the cedars seemed to be too harsh and the wooded area too shady for the Stargrass to grow. 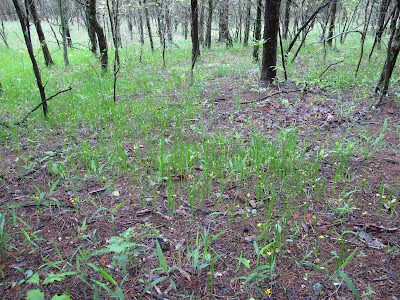 The Yellow Stargrass has now successfully spread into the partially shaded woodland area and created an extensive colony. 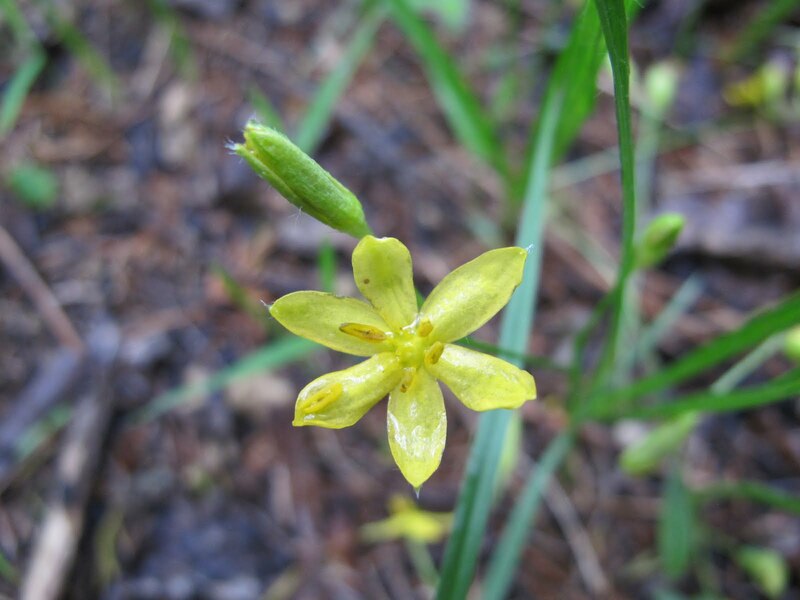 The bloom appears to have six petals, but the six parts are actually made up of three sepals and three petals which share the same shape and color. In this situation, the parts are often referred to as tepals, much as you would refer to a group of men and women by the single term people. Lilies commonly display this characteristic, which works very well since the Yellow Stargrass is of the Lily Family. 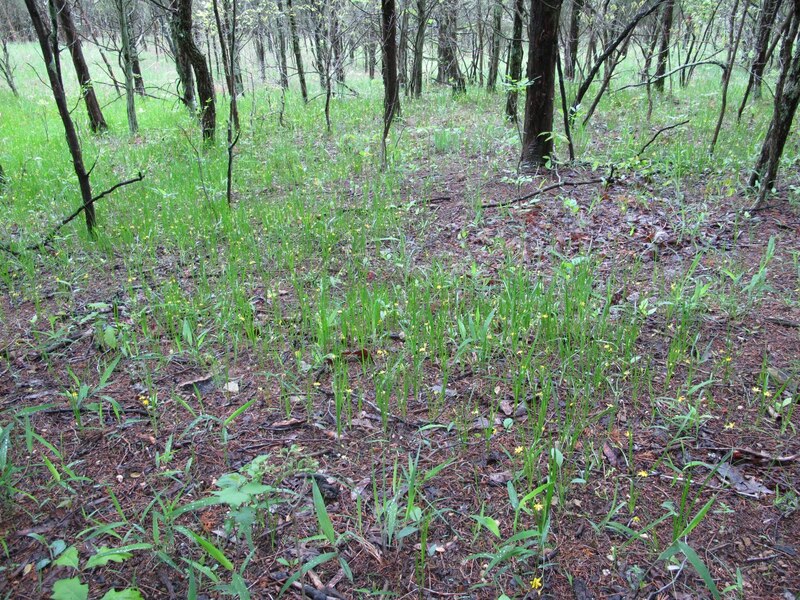 Yellow Stargrass has become the dominant species in the newly created transition zone. 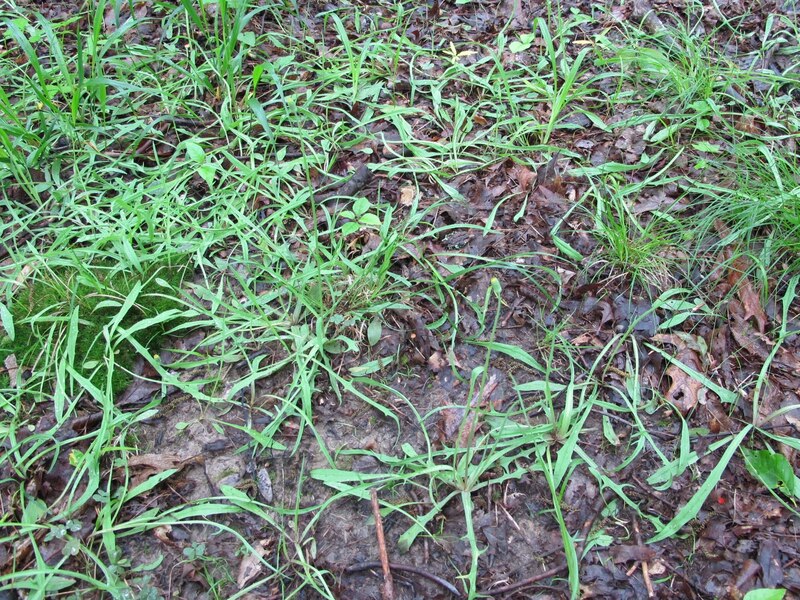 There wasn’t much growing here before, so you can’t say that the Stargrass has displaced anything else. It has just been more efficient at utilizing the newly available suitable space. There’s now Stargrass 50 feet into the woods and it still appears to be spreading. Now I’m curious to see how far it goes and to find out if other plants will begin exploiting that same territory. I managed to find time between the storms to get into the woods to check for fallen trees. No live trees had gone down, but there were several dead trees that had changed from a vertical to a horizontal orientation. The frequent rains we’ve been having allow the dead trees to become saturated with water. This can increase the weight of the log by several times. The added weight, coupled with strong storm winds, makes the dead trees much more likely to fall. 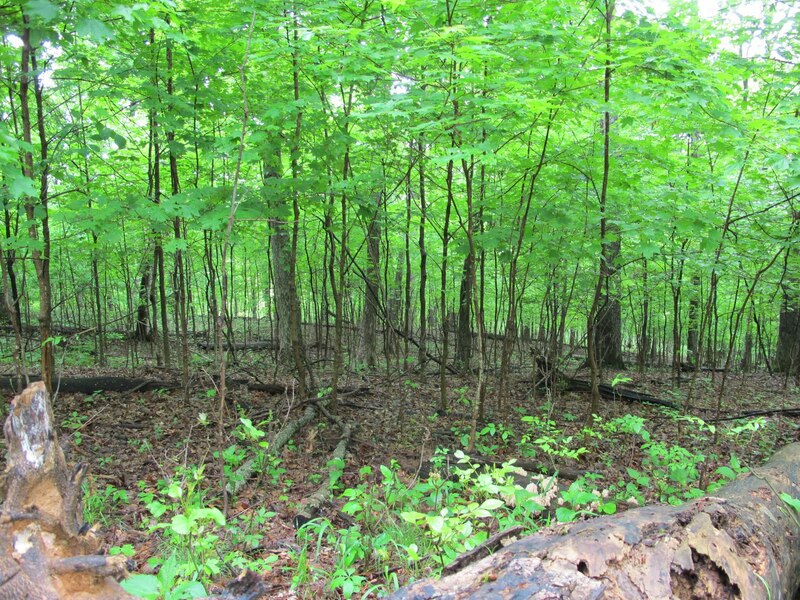 Something I found much more noticeable than the newly downed trees was the browse line created by Whitetail Deer foraging the Sugar Maple understory. 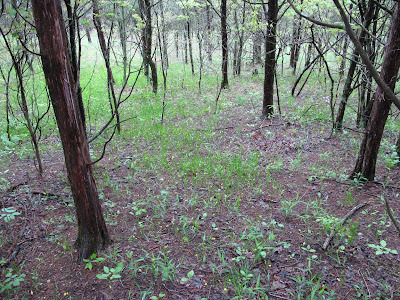 A browse line is a phenomenon that occurs when herbivores consume all of the vegetation in the woods between the ground and the level of their highest reach. A condition is created where a clearly visible line is formed between the leafed and the leafless areas. This is generally an indication that a population of animals is reaching a density that could severely stress the local food supply. It’ll still be a while before we have starving deer at Blue Jay Barrens, but this is a sign we’re headed in that direction. 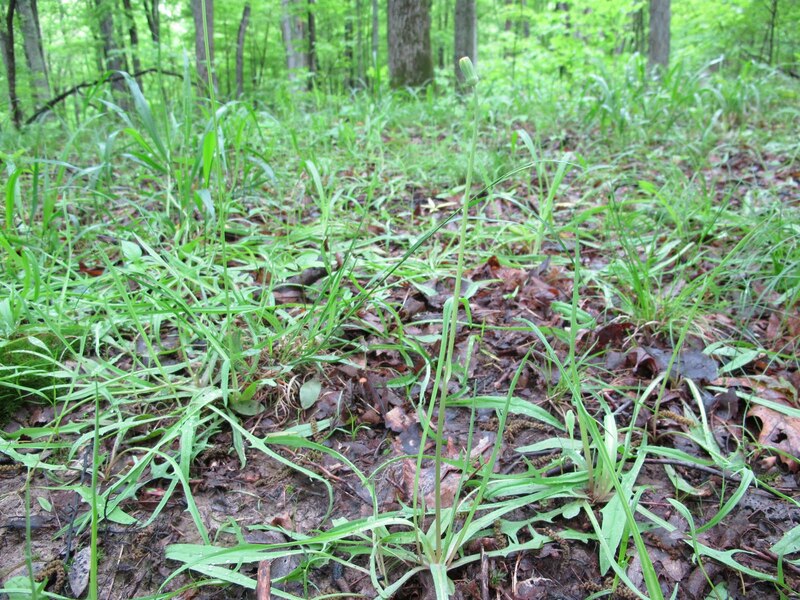 The concern is what will happen to the local plant populations as the deer are forced to eat any palatable greenery they can find. 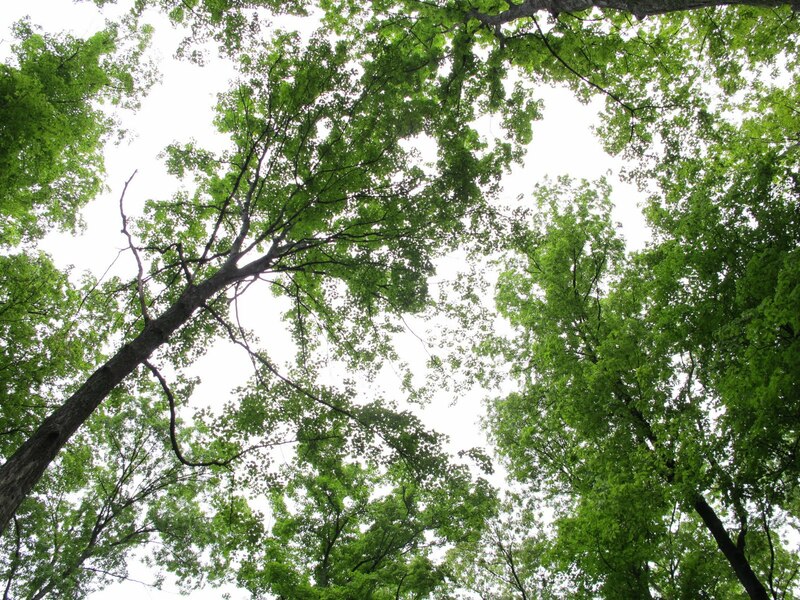 Trees falling to storms are what opened the woodland canopy and allowed in enough sunlight to encourage a flush of young Sugar Maple trees. The maples are fighting to fill those few sunny openings in the canopy. 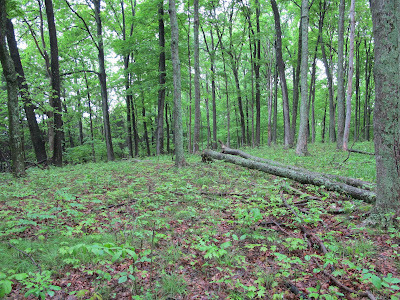 A few hundred feet away, I found some more fallen trees in an area that has virtually no understory shrubs or trees. 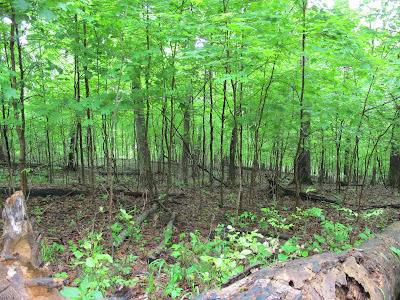 There are Sugar maple seedlings in this area, but they don’t receive enough sunlight to continue their development. This is what the first area looked like 25 years ago. Sometimes it doesn’t take a big change in the canopy to trigger a noticeable shift in the structure of the woodland floor. Even though most of this is outside my control, it’s nice to know how things are likely to respond to particular events. Browsing deer, heavy rain and windy weather will continue and I will continue to look for the positive side to each event. Growing on this site last June, I found a set of orchid leaves with a bare flower stalk. I thought then that it was probably Large Twayblade, Liparis liliifolia. 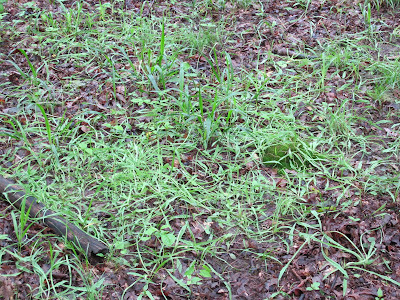 I came back yesterday to see if I could catch the plant in bloom and found that the whole area had been torn up by the Wild Turkeys. The turkeys had done a pretty thorough job of turning over the leaf litter. Fortunately, by brushing away a few leaves, I uncovered the plant I was seeking. 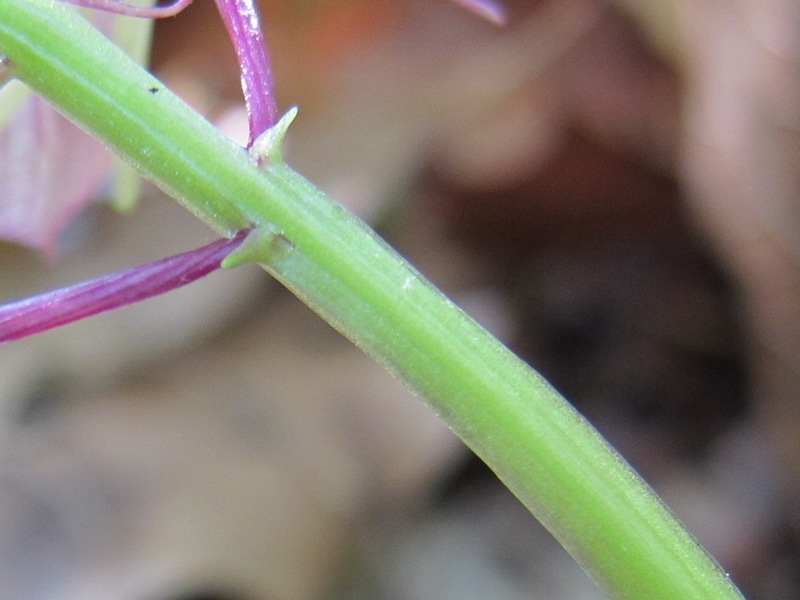 A slight bend to the flower stalk was all the damage the plant had suffered. It is as I suspected, a Large Twayblade. It’s so much easier to identify plants when the flower is there for you to see. Last year it was just the stalk and some tiny pointed bracts that I had to deal with. It’s a nice feeling knowing that I had made a correct identification. 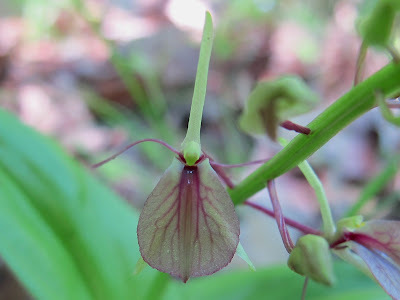 It would have been even nicer if I had been wrong and brushed away the leaves to find an orchid I had never before seen. Large Twayblade is just beginning its blooming period. My notes on Adams County Flora show that this plant should be flowering on May 25. This makes it look like things are pretty much on schedule, except that most of the Blue Jay Barrens plants bloom about two weeks later than those found in the central part of the county where bloom dates were recorded. This suggests that things are running a little ahead of schedule here. Orchid flowers always present you with a bloom that borders on being unreal. 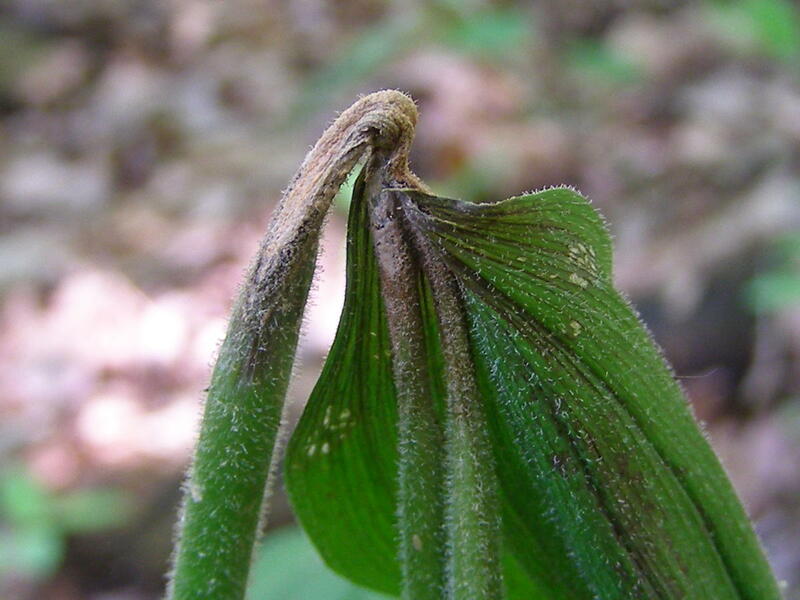 Many people are unaware of the existence of orchids in Southern Ohio and they’ll give me a funny look when I suggest they spend some time in the woods looking at orchid flowers. Most just plain don’t believe me when I tell them there are 13 species of orchids just at Blue Jay Barrens. Of course, many people don’t believe anything I say. I’ll take a moment here to share a little story that has nothing to do with orchids, but illustrates how people disregard most of what I say. If you want to stay with the orchids, skip on down. While in college, I was seated across the card table from a fellow student when a bit of ash fell from his cigarette and lodged between the outside of his shirt pocket and his cigarette pack. I watched as the fabric began to burn and form a hole. Me: “Your shirt’s on fire.” I point a finger towards his pocket where a column of smoke is beginning to form. 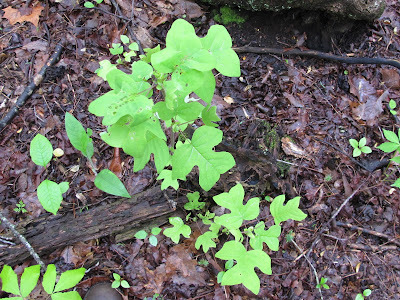 Even though this plant is alone, I did find another population on the next hill that had about two dozen plants. 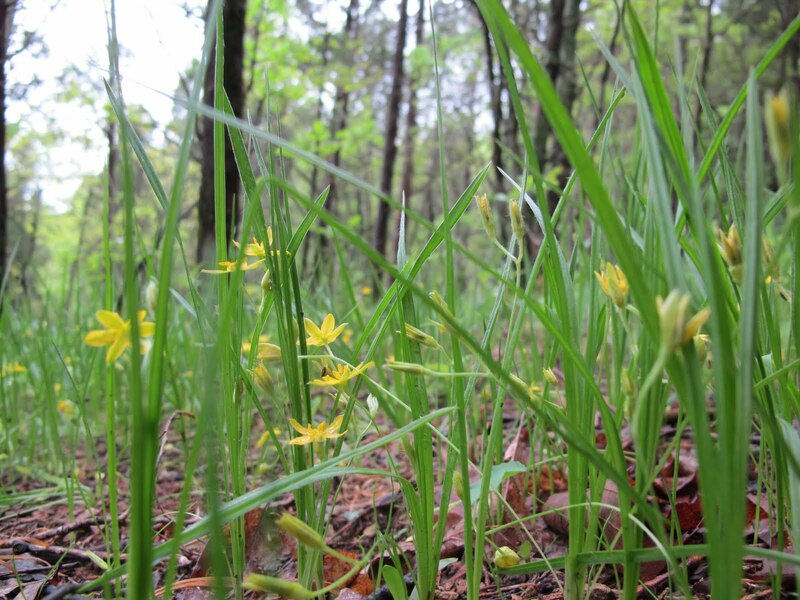 Large Twayblade grows in partial shade and begins to suffer if sunlight is much reduced. I’ll have to watch these areas to assure the plants don’t get overgrown. Rare plants don’t have to be eye-catching beauties, but they should at least hold themselves up with some semblance of respect. 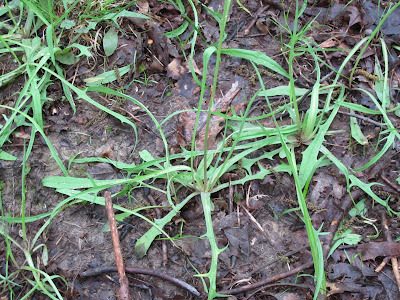 This collection of Potato Dandelion, Krigia dandelion, looks more like a wilted salad tossed to the ground than it does an uncommon Ohio native. 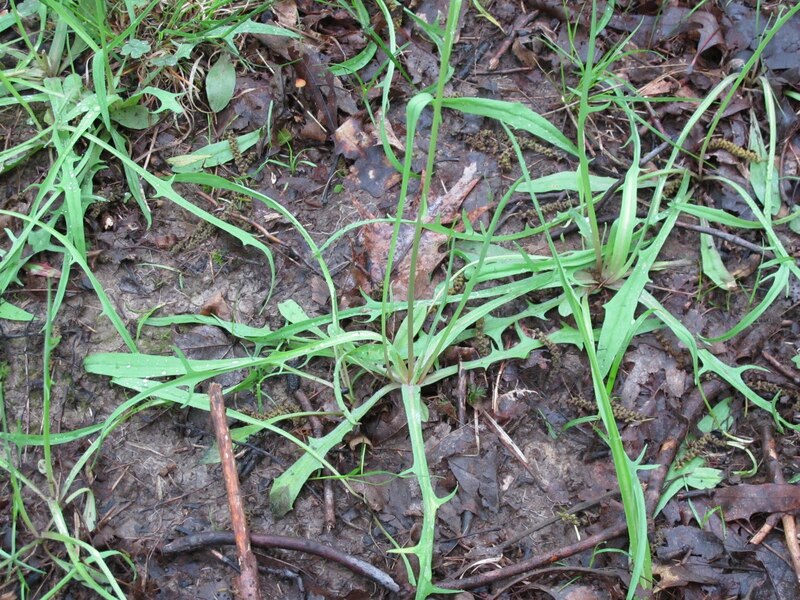 Over most of its range, Potato Dandelion grows in full sunlight or in the partially shaded conditions found in open woods. 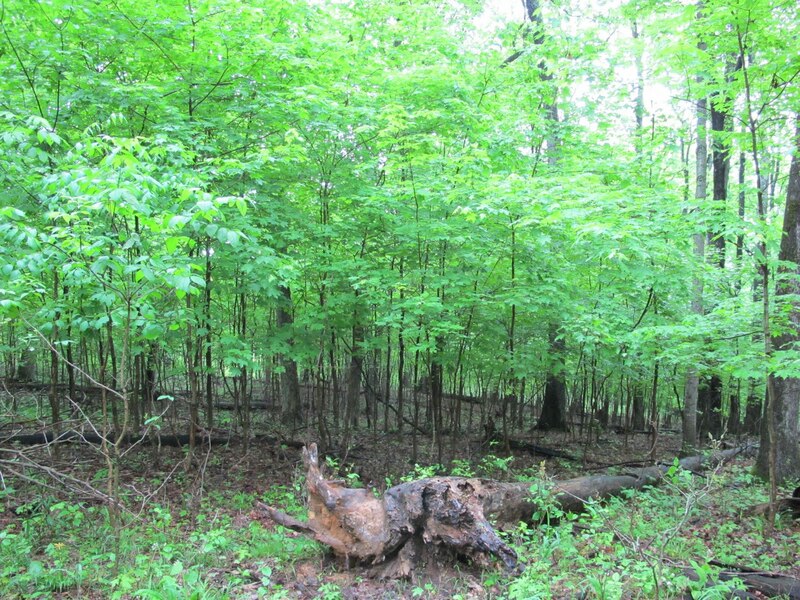 At Blue Jay Barrens it is found beneath a full deciduous woodland canopy. 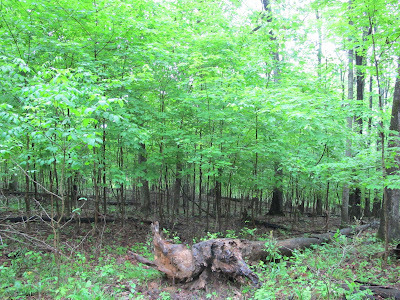 In these more shaded conditions, the leaves tend to sprawl across the ground. 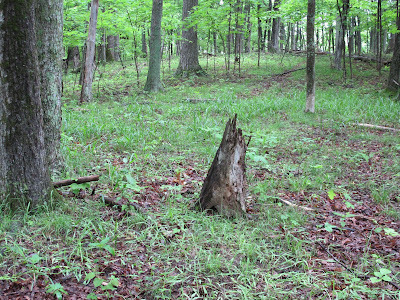 I’m often reminded of Dali paintings when I observe the limp plant draping itself over forest floor obstructions. The leaves would normally be held vertically if the plant was growing in a sunny situation. I don’t know if the horizontal positioning of the leaves in a shaded site is due to a lack of plant vigor resulting from lack of sunlight or if the plant is growing the leaves in this position in order to take best advantage of available sunlight. I know it’s a subtle difference that may not have any importance. I would just like to know if I’m viewing plants that are being stressed because of lack of light or if they are plants healthily taking advantage of a natural adaptation to low light conditions. The Blue Jay Barrens population of Potato Dandelions covers about 6,000 square feet along a ridge top covered in mixed deciduous forest. Cattle historically had access to this area and probably spent much of their time on the ridge top. 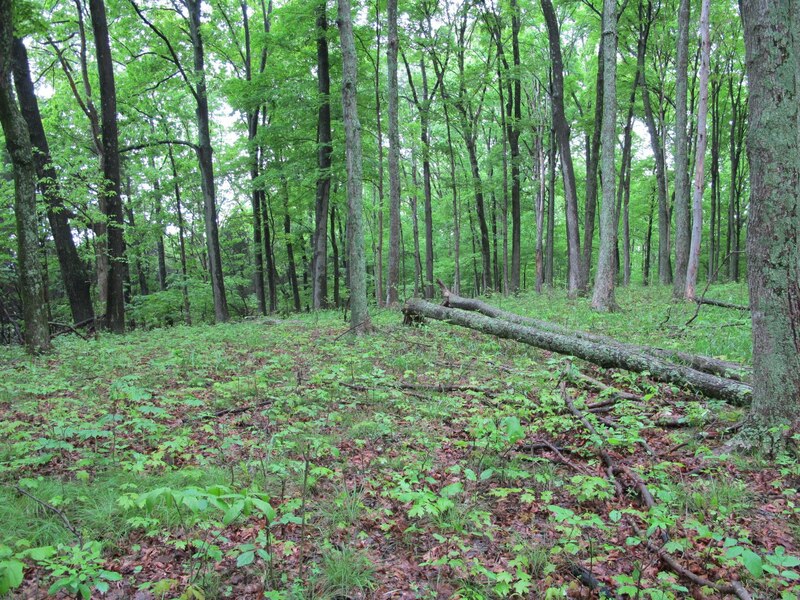 The woods was timbered several different times over the last 80 years, but it was never clear cut and the canopy cover always stayed above 90%. I just find it odd that a plant that favors open areas would be found in such a shaded place. The size of the Potato Dandelion population has really been expanding during the last ten years. I think one factor benefiting the plants has been the increase of Wild Turkeys in the area. 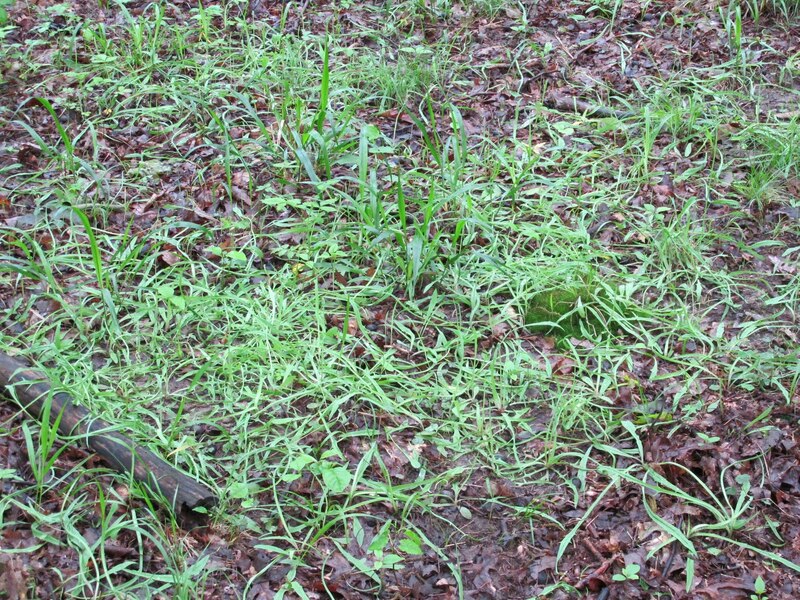 Plants that fight their way up through thick leaf litter always have fewer leaves and no bloom. I used to rake the leaves off of a few spots each year so some flowers would develop. Now the turkeys scratch away the leaves and expose much more bare ground than I ever did. The plants respond with an abundance of flower stalks. Flowers normally open in the morning on sunny days. 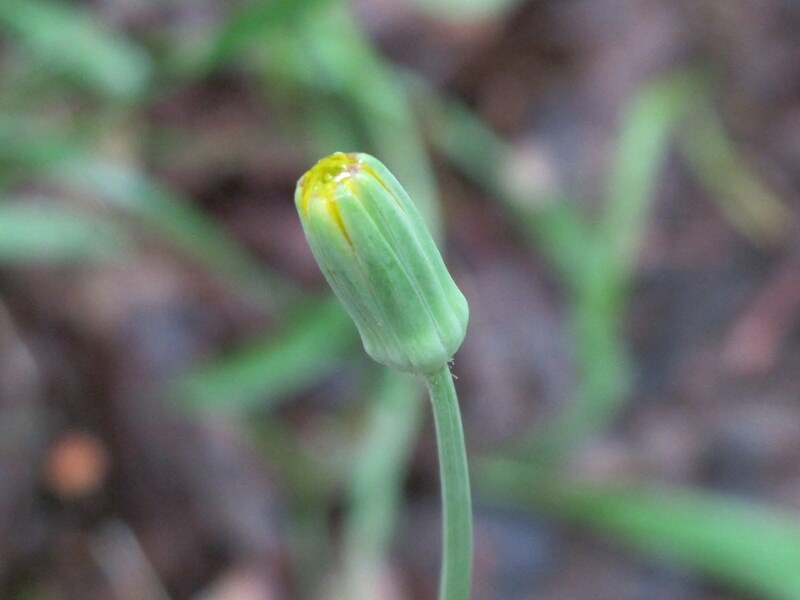 I’ve yet to see the first bloom this year, maybe because I rarely see the sun. Even in years when we have many blooms, I don’t find any viable seed in these flowers. 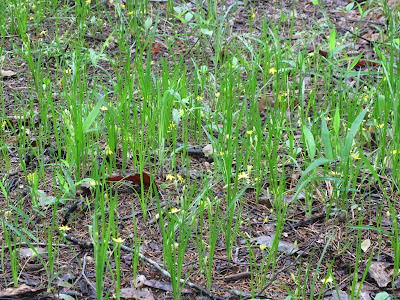 Possibly there’s a lack of pollinators or it could be that this is a large population of clones that are not self fertile. At least the population keeps increasing so I should have them around to study for a long time to come. 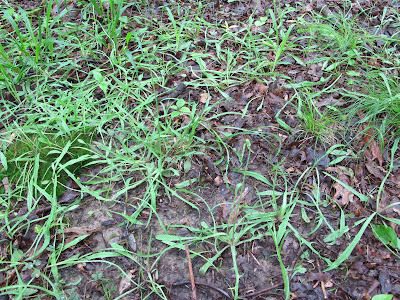 Plants are actively growing and that means that insects are out to eat them. 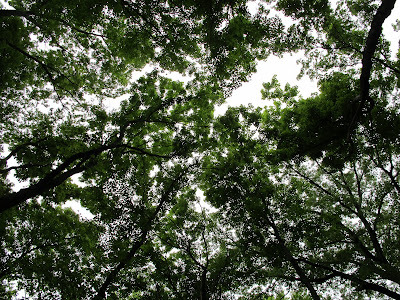 It’s frustrating to be unable to reach a tree’s canopy when you see something interesting going on up there. This Tuliptree was showing damage to the majority of its leaves, but the nearest leaf was thirty feet above my head. Fortunately, trees come in many sizes. If you can’t reach into the tall trees, look down to find a small one. 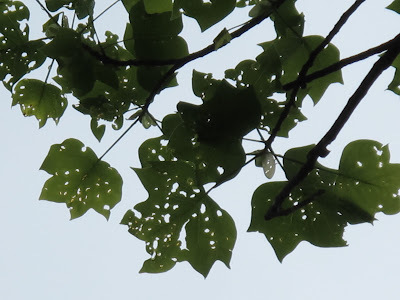 Here are signs of feeding, so there should be an insect near by. Many insects feed at night and conceal themselves during the day. 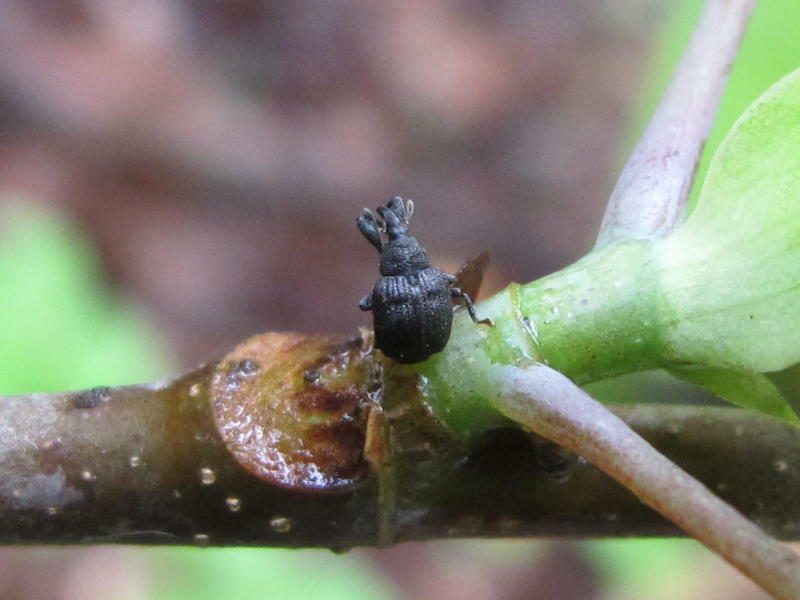 The best way to find leaf feeding insects is to search down the petiole until you reach the stem and then continue down the stem until you reach a good hiding spot. 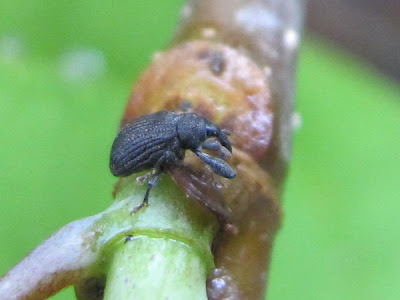 At the base of the new growth, I find Odontopus calceatus, the Yellow Poplar Weevil. That seems logical, since it’s eating a Tuliptree, AKA Yellow Poplar. The Yellow Poplar Weevil eats from the bottom of the leaf and eats everything except the upper layer of leaf cells. Each small feeding area is roughly circular or oval in shape. The single layer of uneaten cells soon dries and falls away, leaving an opening through the leaf. 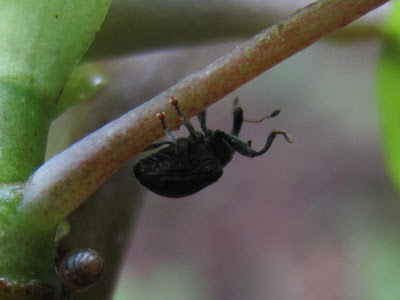 Weevils have amazing snouts. Most people never see the snout because of the small size of these beetles. 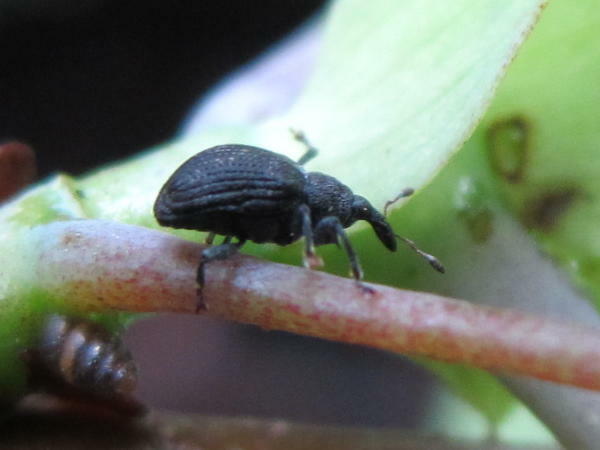 It would really be something to have weevils grow to June Bug size. This individual was pretty tolerant of my intrusion, but soon moved off to find a more secure location. The adult weevils will soon be laying eggs on the leaves. 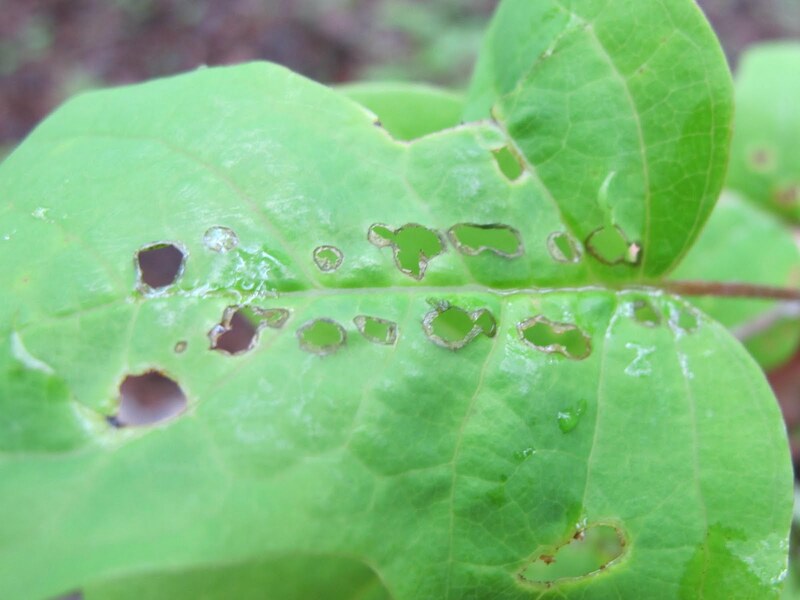 The larvae are leaf miners and will leave feeding tunnels across the surface of the leaves. I’ll have to look for those later on.